“So what are you doing for your birthday weekend then, John?”, I was asked by someone at work earlier this week. Well, on the Saturday evening, oh reader, I ran away to the circus. I try to do this every year. It is not, of course, just any old circus. 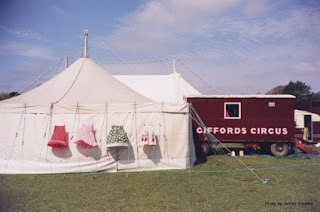 It is the magnificent and wonderful Giffords Circus, which cmaps on Minchinhampton Common, just yards away from my mum’s front door, every summer. The story of Giffords is well known to the people of Gloucestershire, readers of the Tatler, Country Life and very few other people. Nell Gifford and her husband Toti built their collection of wagons from scratch and went off on the roads around the West Country. She is an Oxford graduate who always wanted to run a circus. He is a devoted if slightly eccentric husband. Both are living their dreams, accompanied by an extraordinarly talented company of performers, including strongmen, slackrope walkers, clowns, acrobats, musicians, horses and a goose. Saturday’s show as as good as ever. If not better. Seldom have I been so excited by the appearance of a person dressed up in a bear costume, dancing like an overweight and very shaggy John Travolta. Extraordinary.